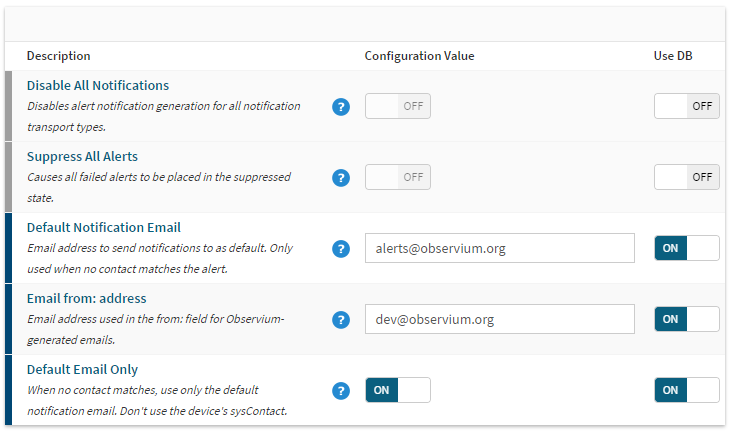 By default Observium will attempt to email alerts to the sysContact retrieved from the device via SNMP. If a default email contact has been configured in the configuration, this will be used for all devices instead. These settings can also be found in the "Alerting" section of the web configuration interface. Where a contact has been associated to an Alert Check or Syslog Rule, this will be used instead of the default or sysContact entries. Clickatell is an SMS gateway service. The Clickatell notification transport requires an API Key from Clickatell. You also need both a recipient and sender telephone number. The E-mail notification transport requires only an email field and uses the email settings configured in the config.php. E-mail is used as the default transport when none others apply to the alert. Please see the Default section. We recommend using a local MTA on the Observium server itself rather than using SMTP. Hipchat is the enterprise messaging platform from Atlassian. 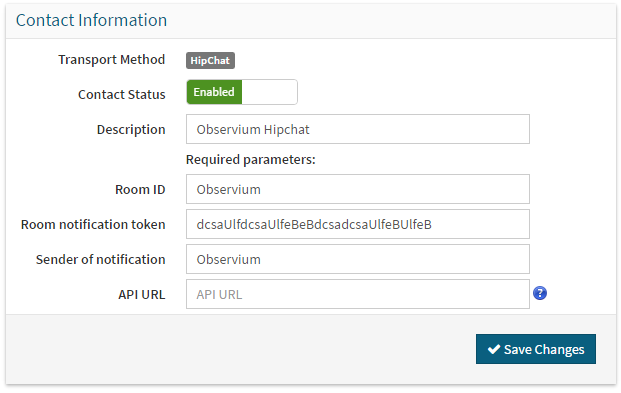 Observium sends messages to Hipchat using the Room API. In order to find a Room Token and Room ID, go to the "Rooms" tab of the Hipchat instance web interface. The Room ID is the name of the room. You can create a Room Token by selecting the Room, going to the "Tokens" side tab and creating a new Token with "Send Notification" permissions. Messagebird is an SMS delivery platform. It facilitates delivery of text notifications to mobile phones. To send notifications via Messagebird you need an API access key from Messagebird along with your originator number and a recipient telephone number. Pagerduty is a specialist alert management service. Pagerduty has specific support for Observium and maintains their own documentation here. 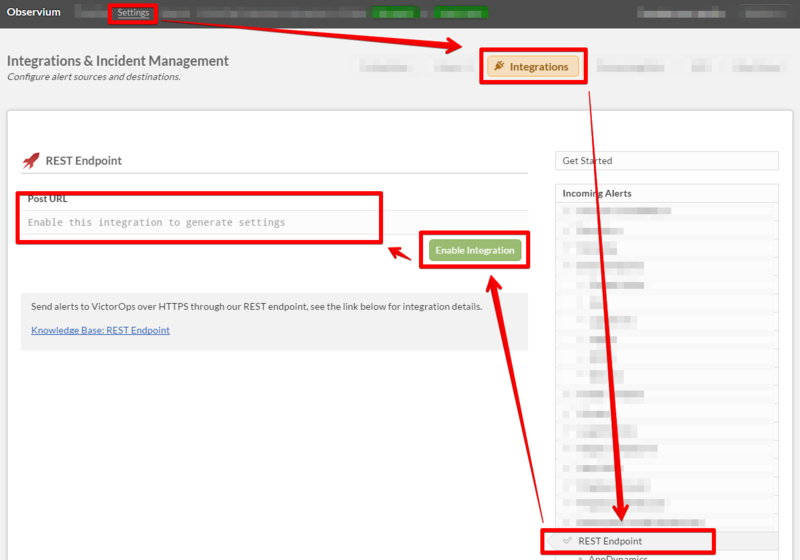 Pagerduty integration only requires an Integration Key which can be obtained by adding an Observium Integration following the instructions on the Pagerduty site above. Once configured Pagerduty will keep track of alert incidents, including recovery. Pushover is a service that allows you to send push notifications to mobile devices and desktops. To use Pushover with Observium, you need to create a new application for Observium in your Pushover control panel. Enter the API key for this application in the transport configuration, and use a user or group key (long string of letters and numbers, not an e-mail address) as destination. Observium can export alert and recovery events via a simple external script interface. Variables are exported via environment variables. Some variables are only available for specific alert sources. Slack is an enterprise group chat platform. 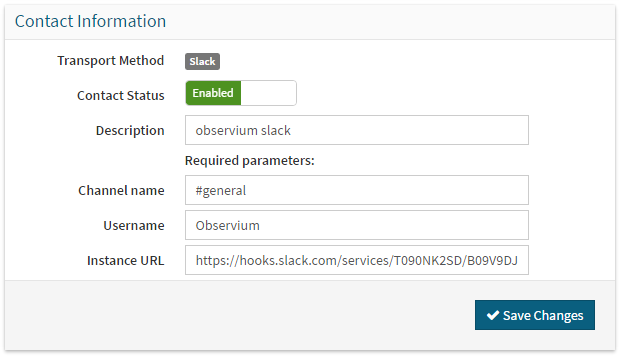 Observium uses the Slack webhooks API to send notifications. This integration is also compatible with Rocket.Chat, using the Webhook URL from an Incoming Webhook configuration in Rocket.Chat. To use Slack integration you need to obtain a Webhook URL from Slack by creating an incoming webhook integration. 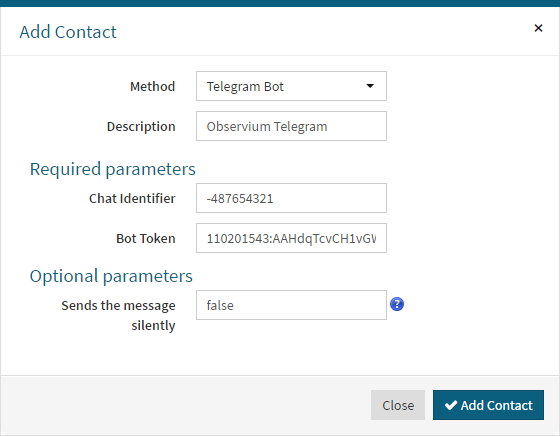 You also need to set a Channel Name and a Username for your Observium messages. Kannel SMSbox is an open source SMS gateway that can be used to send text notifications to mobile phones. You will need authentication credentials for the SMS service on your gateway, and the destination phone number. Telegram is a messaging application available for many platforms including iOS, Android, Windows, MacOS and Linux. To use it as a notification transport you need a Telegram account, Telegram Bot and (optional) Group, where this Bot and Account have been added. Install Desktop Telegram application, since some steps can only be done from the desktop app. Create Telegram Bot (if you don't already have one). For this you should talk to BotFather and follow the steps described here. Request a new Bot via command /newbot, you will be requested for choose name and username for Bot. The bot username is required below for adding it to Group and for requesting the Chat identificator. At the end you will receive a token to access the API, ie 110201543:AAHdqTcvCH1vGWJxfSeofSAs0K5PALDsaw. This token is required to send notifications, see below. Add Bot created above to this new Group, and set the Group name to whatever you like. Remember this Group name! Now you have Bot Token (ie 110201543:AAHdqTcvCH1vGWJxfSeofSAs0K5PALDsaw) and Chat Identifier (ie -487654321), which can be added to the appropriate contact fields. VictorOps is a specialist alert management service. Observium integrates with VictorOps via its REST Endpoint API. To use VictorOps integration you need a REST Endpoint URL, which can be obtained from the VictorOps web interface. Follow the steps in the image below to obtain the REST Endpoint URL. The URL will appear in the box labelled Post URL. Once you have a REST Endpoint URL, you can create a VictorOps contact. By default notifications will be routed to everyone. Observium supports both failure and recovery notifications and sends entity and alert checker information to VictorOps. An example alert and recovery notification is shown below. Textlocal is an SMS delivery platform. It facilitates delivery of text notifications to mobile phones. To send notifications via Textlocal you need an API access key from Textlocal along with your originator number and a recipient telephone number. The Web Hook transport is a generic transport designed to allow you to write your own code to consume our alerts by providing the maximum amount of data. The only requirement is a URL to direct the POST request to. The BODY of the request will be a JSON array containing an array of data.